So when I booked my flight in August to go see my lovely friend Emily in Los Angeles obviously I had no idea what her schedule would be. Bless her little med school-bound heart, she has two enormous tests on Monday and so we couldn't get sloshed and dance around like morons in a random bar for the weekend. Lady had to study. And understandably so (seriously, I had to ask her what organic chemistry was cuz i had no idea). So she leant me her fascinating Prius and I set out for downtown Claremont. So what did I do there? 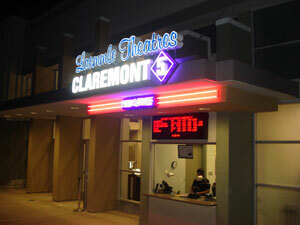 I found a movie theater of course! As maybe some of you have caught on at this point, I will watch almost anything (NOT Window Water Baby Moving. I don't care how much you pay me. I'm scarred for life from that horror.). The more intellectual fodder I like to save for watching with others simply because I enjoy the different perspective for the more complex themes. But going to see brainless rom coms, camp films, and kid's movies by myself? I'm totally always up for it! So despite the theater's really cool offerings (indie films galore!) 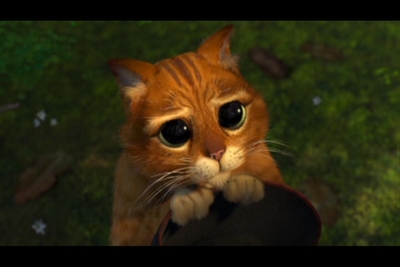 me and myself opted for the new Shrek spinoff, Puss in Boots. Now I thoroughly enjoyed Shreks 1 and 2 but had missed Shrek the Third and other spinoffs (didn't they have a Halloween one?) so I wasn't really sure where the franchise had ended up. But I've got to say, I'm really glad I saw it. I mean how could I resist that face? 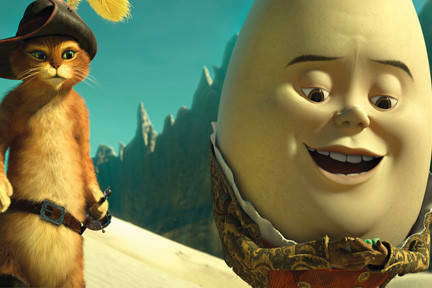 The plot revolves around Puss reuniting with Humpty Alexander Dumpty and Dumpty's new partner Kitty Softpaws in a quest to steal magic beans from Jack and Jill and find the golden eggs of fairytale beanstalk fame. Puss is originally reluctant to join Dumpty and Kitty because of Dumpty's former betrayal of their friendship, a ploy that involved Puss unknowingly robbing the bank of their hometown, San Ricardo. But he reconsiders after Humpty Dumpty reassures him that the eggs will go to their hometown of San Ricardo. But Humpty Dumpty and Kitty might not be as trustworthy as they seem...The ensuing adventure is pretty well done and appropriate for all ages to boot. Puss (Antonio Banderas) is his usual charismatic self and his new girl, Kitty (Salma Hayek), is pretty charismatic herself. Although some might argue that Humpty Dumpty was a little annoying, I feel like knowing that he was voiced by Zack Galifianakis suddenly made that ok. Seriously, who trusts an egg in a matador suit? The characters all blended together in a typical outlaw way (Typical boy interested in girl so he stays even though he hates the other guy even though the girl and the untrustworthy ex-friend are in cahoots. Formulaic.). Also, this film seemed to trim down the fairytale sidelines, giving the audience a better chance to get to know the characters as opposed to setting up multiple digs on classic folklore and nursery rhymes (although at this point that probably also has to do with the fact that they're running out of them). Cameos by Jack from the beanstalk tale and Little Boy Blue were my favorites. The thing that I loved most about this film was the merge between the fairytale thing that we have seen in the earlier Shrek movies and the introduction of classic Western-style cinematography. There are quite a few scenes that recall classic westerns like The Wild Bunch, The Good the Bad and the Ugly, and even cheesier ones like Zorro. But this franchise never does anything without a little tongue in cheek and a lot of the genre is both honored and made fun of simultaneously. I enjoyed their usage of multi-perspective shots in the same frame, which is a very hokey kind of 1960's trick (circa The Thomas Crowne Affair original with Faye Dunaway, check it out!). But the whole aesthetic of the film was very fitting for the subject matter, and especially for the voice of Antonio Benderas. Good job DreamWorks!